In response to my post on easy to grow grains, two of you asked whether I was concerned about amaranth being a weed. I decided to do a bit of research and disentangle fact from fiction. The word "amaranth" can be used to refer to any plant in the genus Amaranthus --- 70 species total. Some species are weeds and some are useful foods dating back thousands of years. The weed species are generally known as pigweed and include Amaranthus albus, A. blitoides, A. hybridus, A. palmeri, A. powellii, A. retroflexus, A. spinosus (the one that wreaks havoc on my bare feet in the summer), A. tuberculatus, and A. viridis. I wonder whether any of these plants were also grown by Native Americans for food, accounting for their widespread growth across the U.S.? Unfortunately, I couldn't find any data on this. 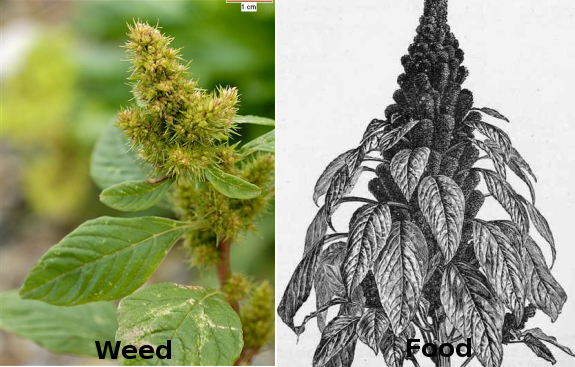 On the other hand, A. caudatus, A. cruentus, and A. hypochondriacus are grown as food plants, with the latter being the species most often grown in the U.S. Amaranth was grown by the Incas, the Aztecs, and various Native Americans in what is now Mexico until the conquistadores came and nearly wiped amaranth out of existence. Nowadays, you can find the seeds of the edible varieties for sale from some of the more heirloom-inclined seed companies. We opted to buy some Manna de Montana Amaranth from Seeds of Change --- I'll let you know how it goes as the growing season progresses. Meanwhile, I splurged on a few more experimental crops --- Hungarian Blue Breadseed Poppy, Temuco Quinoa, Urd Sprouting Bean, Black Kabouli Garbanzo Bean (since we have to drive an hour to get these in the store), Hullless Oats (thanks for the tip, Sena! ), and Afghani Sesame. I figure at least one or two should work out and make it onto our list of regulars! Read our ebook and learn to become financially independent. I have a TON of Spiny Amaranth available which came up as a weed in a nearby community garden. I know there are varieties of Amaranth that are preferred as people food, but wondered about using the greens and seeds of the spiny variety as chicken feed. Can't recall what Harvey Usery says -- borrowed the book from the library and haven't bought a copy yet -- but wanted to know your thoughts. I'm concerned that some "weed" feeds, like Curled or Yellow Dock can have too much Oxalic acid if overfed. Any thoughts on the weed varieties of Amaranth? "Amaranth is a plant I grow because of its beauty and its nutritious seeds, millions of them per seed head --- extremely tiny, but the Aztecs built an empire on their high-protein nutrition. It readily reseeds. For years now I haven't bothered to plant it --- I just thin out the abundant volunteers where they're in the way, welcome the ones that fit in, and cut the mature seed heads for feeding to my mixed flock."